The best solar mole repellers keep moles and other critters out of your yard. This unique device, also known as a mole scarer, work by using solar energy to create ultra-low frequency sonic pulses that penetrate deep the soil. This is drives away most burrowing pests, like moles and gophers, to help keep your yard healthy. Some of the best sonic mole repellers happen to be solar powered. Keeping you free from batteries and wires found in other types of electronic mole repellers. And, unlike poisons, and other types of pest control, they are harmless to animals, the environment and humans alike. Down below we have tested and reviewed each of the top solar powered mole repellers on the market. First on the review is the Netcat solar mole repeller. This is one of the more premium solar repellers as it uses quality materials and has one of the best coverages on the market. The Netcat uses a powerful solar panel to power its internal battery. This battery charges throughout the day and allows the device to work for 5 full days without being charged again. Once charged the Netcat produces vibrating sonic pulses of 400 Hz for 5 seconds with 20-second intervals. Since the Netcat is virtually always charged it produces these pulses all day long to successfully keep burrowing pest away. Not only are these pulses regular, but they are also very powerful. The Netcat repellers operate in a circular pattern. This circular pattern covers approximately 8000 square feet. Which is one of the best coverages on the market. With that being said Netcat recommends to install 2 devices every 105 feet for the best results. As for the repellers, they are made from durable materials. Both the solar panel and aluminum spike of the repeller are weather-resistant and corrosion-proof. This allows the device handle the wear and tear of the outdoors with ease. Netcat does recommend to install the unit 4 inches above the ground to prevent it from being immersed in heavy rain. Overall the Netcat solar mole repeller is a great option. The kit comes with 2 repellers that are built with quality materials and are very durable. In addition they have one of the best coverages on the market. Which is ideal for the best results. Best coverage on the market. Built with weather-resistant and corrosion materials. Runs for 5 days on a full charge. Next is the SparkPod solar mole repeller. This one looks great and comes with 4 units, allowing you to get the best coverage possible. The SparkPod uses a powerful solar panel to generate energy for the repeller. This panel is highly efficient and charges in as under as 4 hours. A full battery will then last 5 days without dying. Once charged the SparkPod emits sonic pulses every 20 seconds. These pulses are very subtle and can rarely be heard by humans. With that being said they are very successful at preventing these animals from entering your yard. Each of the SparkPod sonic repellents covers up to 7,000 square feet. This is one of the better coverages on the market. SparkPod recommends installing each of your 4 devices 98 feet of each other. They are made from durable plastic material, which is tough enough to last years in nature without issue. With that being said, SparkPod recommends installing them 4 inches above the ground so that they don’t get emerged in rain water. In the end the SparkPod solar mole repeller is one of the best kits you can buy online. Each unit covers 7,000 square feet, which is good compared to other options. In addition, this kit comes with 4 devices so that you can cover a large area. Each repeller has a coverage area of 7,000 square feet. Kit comes with a total of 4 repellers. Emits pulses every 20 seconds. Next is the Xiaxia solar mole repeller. This is another top option for keeping those pesky mole tunnels off your property. The kit comes with 6 units, covering 7,000 square feet. Which is a larger area of space than most other competitors on the market. To power the Xiaxia is a small solar panel on top of the device. This panel charged the repellers internal battery during the day. A full charge lasts 5 days running out of energy. Once turned on the Xiaxia will radiate 400 HZ low-frequency sonic pulses every 30 seconds. One of these repellers covers 7,000 square feet, which is about average for the industry. Xaixia also recommends to install these repellers within 98.5 feet of each other. One thing to keep in mind is that the Xiaxia emits these pulses a lot slower than most other options. While it’s still keeps critters away, its less effective than other models that have quicker times. Since this repeller is meant to be used outdoors its constructed with watertight, anticorrosion, ABS plastic unit. This plastic is highly durable and can withstand years in the outdoors. To get the best lifespan possible you should reframe from installing these devices in areas where they can be submerged in water. 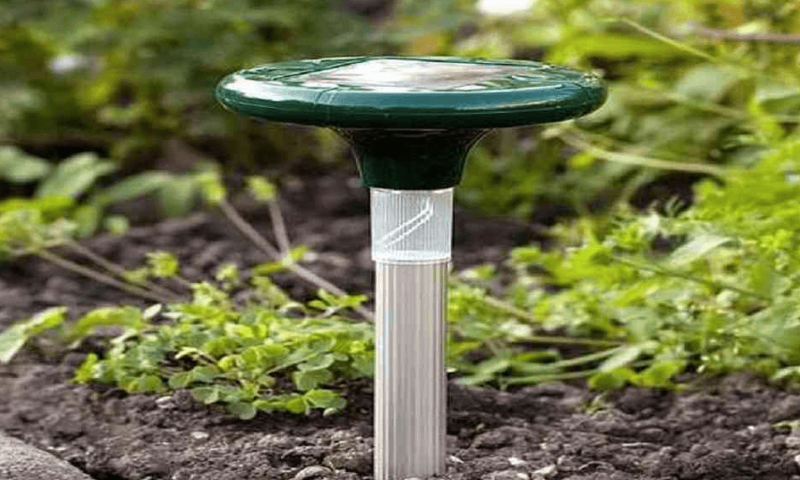 Overall the Xiaxia solar mole repeller is a great option. It has a pretty good coverage and comes with 6 separate units. This allows you to cover a large area of space on a low-budget. The only negative thing is its slower pulse rate, which isn’t really a big deal. Built with durable ABS plastic. Kit comes with 6 devices. Emits pulses every 30 seconds. Last is the Vensmile solar mole repeller. It is very durable and waterproof. Plus, it has a range of 6,000 square feet. The only negative thing is that this rating is lower compared to other options. The Vensmile uses a small solar panel on top of the device. This high efficient panel collects energy during the day and stores it inside the devices internal battery. Since the panel is efficient it only takes around 4-6 hours to fully charge the battery while in direct sunlight. When the battery is charged the Vesnmile repeller emits ultra-low frequency sonic pulses every 25 seconds. Since moles and other burrowing critters are essentially blind and overly sensitive to sound/vibrations, this pulse irritates them and prevents them from entering your yard. This particular repeller has a coverage of 6,000 square feet. Which is smaller than most other competitors on the market. Since this is so Vensmile recommends installing these devices every 35 feet. One thing to keep in mind is that since the Vensmile is less powerful than other options, it has a better battery life and can last 7 days on a single charge. As for build the Vensmile is very durable. It uses quality plastics that are IPX4 waterproof. This weather resistant allows the device to be used for years in nature without breaking. In the end the Vensmile is a good choice to choose from. It uses durable and waterproof plastics that are ideal for outdoor use. In addition this option has a great battery life. The only negative thing about the Vesnmile is that it has a low coverage area, which means you must buy more devices in order cover a large area of space. Uses durable and waterproof materials. Has a 7 day battery life. Only covers 6,000 square feet. Solar powered sonic mole repellers are one of the best devices to scare moles and other burrowing animals off your property. These simple devices use solar energy to emit ultra-low frequency sonic pulses. These pulses are completely harmless and unnoticeable for humans. In the end solar mole repellers have a ton of benefits, some of which we discuss below. The first benefit is that its solar mole repellers are humane. You aren’t using dangerous mole traps or poison. Instead you are using frequencies that don’t harm the animal, but successfully keep them away. This avenue is much better then other options like spreading poison. Not only are these devices great for the wildlife, but they are also good for the environment. Solar mole repellers use eco-friendly technology that doesn’t contribute to global warming. They simply convert renewable energy from the sun and convert it into useable power for the device. The next benefit of your mole and gopher repellant, is that they are a convenient way to get rid of moles without spending hours to set up or difficult wiring. This is a problem with electronic mole repellers. Instead, you simply stick them into the ground, let them charge, and then turn it on. Once you turn it on the devices works for itself and emits pulses every few seconds. Since they use solar energy the batteries never have to be changed. Overall, solar mole repellers are a great option for those looking for a humane way to prevent critters from entering your yard. Soon your mole problems will disappear.